Retired University of Wyoming Extension educator Tammie Jensen in Niobrara County has received the national Annie's Project Women In Ag Educator Award for her efforts to improve the lives of others. The award is presented by Annie's Project – Education for Farm Women (APEFW). Annie's Project is an educational program dedicated to strengthening women's roles in the modern farm enterprise. Jensen offered the first Annie's Project class in Wyoming in 2012. Following her program success, she became a mentor for other extension educators offering Annie's Project classes in Wyoming. "Annie's Project would not have happened in Wyoming if it hadn't been for Tammie," said Cole Ehmke, extension agriculture entrepreneurship and personal financial management specialist and coordinator of the program in the state. "Tammie wanted to support the hardworking ranch women of one of Wyoming's most rural counties. She'd heard about Annie's Project and thought it would be a good fit." The award is presented in memory of Bob Wells, a former farm management educator with Iowa State Extension who helped lead Annie's Project nationally. Jensen was recognized for her dedication and excellence in educational programming for farm and ranch women, her skill in teaching farm management and her ability to provide leadership and vision to deliver effective educational programs. As a program host in Annie's, Jensen has led numerous classes, the last in the winter of 2014. "As an educator, she is known for her dedication to her clientele, tirelessly working on programs that will inspire and connect the women (and men and children) she works with. She brought that dedication to Annie's Project, so we're thrilled to see her honored with the Wells Award," noted Ehmke. Annie's Project classes are offered in 33 states. As many as seven Annie's Project classes will be offered this fall and winter in Wyoming. 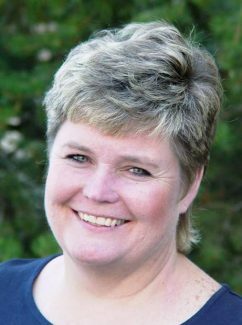 Jensen served as an extension educator in Uinta County from 1980-1988, earned her master's degree in food science and human nutrition from the University of Wyoming in 1992, and then worked as an educator in Carbon County until 1994. She then accepted her position in Niobrara County and also served Converse and Natrona counties until her retirement this month.